3000 MUSLIMS RUN RIOT OVER A CHURCH FULL OF COPTIC BELIEVERS……. – The Tundra Tabloids……. 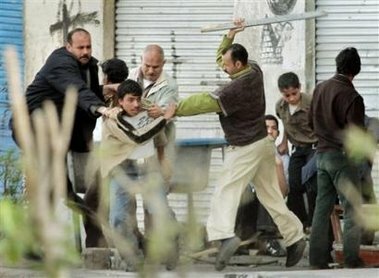 3000 MUSLIMS RUN RIOT OVER A CHURCH FULL OF COPTIC BELIEVERS……. Faithful were gathered in prayer when attack occurred. There were four priests, one deacon and 400 parishioners in the building, women and children also targeted. Fundamentalists fury, egged on by the imam, unleashed by the rumour that the Christians are building a new church. In reality it is a hospice. Cairo (AsiaNews / Agencies) – The toll from an attack on the Coptic Christian community that took place yesterday in the north-western province of Mersa Matrouh, Egypt is 25 wounded, including women and children. A crowd of around 3 thousand Muslims attacked the faithful gathered in prayer in a building adjoining the local church. The fundamentalists fury, encouraged by the imam, was sparked by the rumour that the Christians have begun to build a new place of worship. Around 5 o’clock yesterday afternoon, the Muslims – a group of Bedouins and Salafi fanatics – started throwing stones at a construction site, which they believe in reality will be a new church. Local witnesses reported that security forces present were not sufficient to contain the attack. The police fired tear gas and arrested a dozen people, including Muslims and Christians. Only this morning, reinforcements arrived from Alexandria, thanks to which the Coptic faithful trapped inside the building could return to their homes. Previous Post Previous Post ROBERT SPENCER SPEAKS TO HIGH SCHOOL STUDENTS AT THE REAGAN RANCH……. Next Post Next Post CATHERINE ASHTON: EU CAN’T WAIT TO STICK IT TO THE JOOOOS…….